More great recipes from the flavor master. 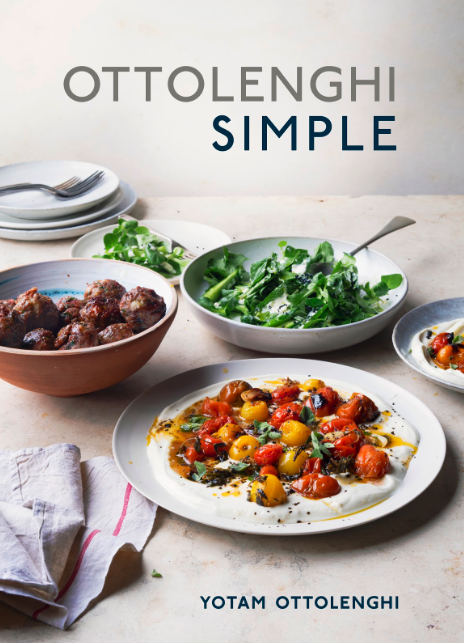 Plainly put, Simple by Yotam Ottolenghi (Ten Speed Press; $35) is the Ottolenghi book we’ve all been waiting for. Previous books have been almost as well-known for their lengthy ingredient lists as their big, exotic, cross-cultural flavours. But Simple is different. These dishes are ones you can scour your cupboards and crisper bin for and emerge a weeknight hero. Each recipe offers a combo of “simple” characteristics: a short cooking time, less than 10 ingredients, something you can make ahead, pantry-based, low effort and/or deceptively easy. Having made a name for himself on his enthusiastic treatment of vegetables, Ottolenghi offers many vegetarian and plant-based recipes here, but meat eaters are also catered to, albeit to a lesser degree. His signature Middle Eastern flavours appear in many of the dishes—just make sure to stock up on tahini, za’atar and preserved lemons the next time you’re at the supermarket. I didn’t get further than the very first recipe in the book before I hit the kitchen. 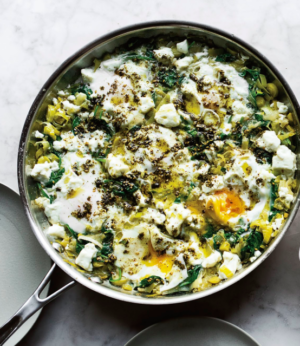 Something about Braised Eggs with Leek and Za’atar sounded so right, and it wasn’t just my husband’s pleading. The symbols at the top of the page told me this was quick, low on fancy ingredients, something I could make ahead of time, and low effort. Leeks are sautéed in butter and oil, before cumin, preserved lemon and vegetable stock are added and reduced. Spinach is folded in, divots are made in the leeky mix, eggs are cracked into them and surrounded by chunks of feta. Once cooked, a little za’atar is brushed over the eggs. These were so good that we were bereft at not having bread to sop up every single drop. For Ottolenghi fans and those who skew plant-based, this book is a probably already on your Amazon wish list. But if you’ve flicked through his earlier books and decided, “Sounds delicious but too much effort,” then you’ll also want to give this one a look. Recipes reprinted with permission from Ottolenghi Simple: A Cookbook by Yotam Ottolenghi, copyright © 2018. Published by Ten Speed Press, an imprint of Penguin Random House. One of the beauties of this dish lies in the exciting contrast between the hot, juicy tomatoes and fridge-cold yogurt, so make sure the tomatoes are straight out of the oven and the yogurt is straight out of the fridge. 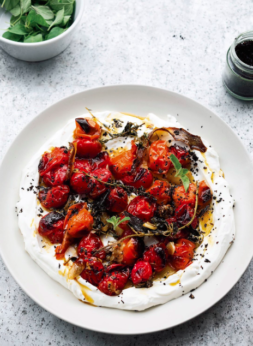 The heat of the tomatoes will make the cold yogurt melt, invitingly, so plenty of crusty sourdough or focaccia to mop it all up is a must alongside. Serves four as a starter or part of a mezze plate. Place the tomatoes in a mixing bowl with the olive oil, cumin, sugar, garlic, thyme, oregano sprigs, lemon strips, ½ tsp of flaked salt, and a good grind of pepper. Mix to combine, then transfer to a baking sheet just large enough—about 6 x 8 inches/15 x 20cm— to fit all the tomatoes together snugly. Place the sheet about 2 inches/5cm beneath the broiler and roast for 20 minutes, until the tomatoes are beginning to blister and the liquid is bubbling. Turn the oven to the broil setting and broil for 6–8 minutes, until the tomatoes start to blacken on top. While the tomatoes are roasting, combine the yogurt with the grated lemon zest and ¼ tsp of flaked salt. Keep in the fridge until ready to serve. Once the tomatoes are ready, spread the chilled yogurt on a platter (with a lip) or in a wide, shallow bowl, creating a dip in it with the back of a spoon. Spoon the hot tomatoes on top, along with their juices, lemon strips, garlic, and herbs, and finish with the oregano leaves and chile flakes. Serve at once. This is a quick way to get a very comforting meal on the table in a wonderfully short amount of time. It’s a dish as happily eaten for brunch, with coffee, as it is for a light supper with some crusty white bread and a glass of wine. The leeks and spinach can be made up to 1 day ahead and kept in the fridge, ready for the eggs to be cracked in and braised. Put the butter and 1 tbsp of the oil into a large sauté pan with a lid and place over medium-high heat. Once the butter starts to foam, add the leeks, ½ tsp of salt, and plenty of pepper. Fry for 3 minutes, stirring frequently, until the leeks are soft. Add the cumin, lemon, and vegetable stock and boil rapidly for 4–5 minutes, until most of the stock has evaporated. Fold in the spinach and cook for 1 minute, until wilted, then decrease the heat to medium. Use a large spoon to make 6 indentations in the mixture and break 1 egg into each space. Sprinkle the eggs with a pinch of salt, dot the feta around the eggs, then cover the pan. Simmer for 4–5 minutes, until the egg whites are cooked but the yolks are still runny. Mix the za’atar with the remaining 1 tbsp of oil and brush over the eggs. Serve at once, straight from the pan. This is a wonderful meal on an autumn day, served with a crisp green salad. The slow-cooked chicken is packed full of flavor and the crust—gluten-free, rich, and corny—makes for a welcome (and lighter) change to a heavier mash. You can make the chicken well in advance if you want to get ahead. It keeps in the fridge for up to 3 days or can be frozen for 1 month. You want it to go into the oven defrosted, though, so it will need thawing before baking. The batter needs to be made fresh and spooned on top of the chicken just before the dish gets baked. It can also be baked a few hours in advance—just warm through for 10 minutes, covered in foil, before serving. I love the combination of the chicken and the corn, but the chicken also works well as it is, served on top of rice, in a wrap, or with a buttery baked potato. Heat the oil in a large sauté pan with a lid over medium-high heat. Add the onions and fry for 8–9 minutes, stirring a few times, until caramelized and soft. Decrease the heat to medium and add the garlic, harissa, paprika, chicken, 1 tsp salt, and a good grind of black pepper. Cook for 5 minutes longer, stirring frequently, then add the tomato puree and tomatoes. Add the water, bring to a boil, then simmer over medium heat, covered, for 30 minutes, stirring every once in a while. Add the peppers and chocolate and continue to simmer for 35–40 minutes, with the pan now uncovered, stirring frequently, until the sauce thickens and the chicken is falling apart. Remove from the heat and stir in the cilantro. If you are serving the chicken as it is (as a stew without the batter), it’s ready to serve (or freeze, once it has come to room temperature) at this stage. 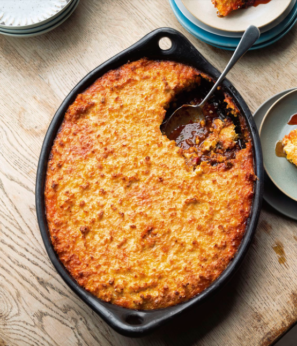 If you are making the corn crust, spoon the chicken into a ceramic baking dish—one with high sides that measures about 8 x 12 inches/ 20 x 30cm—and set aside. To make the batter, pour the butter into a blender with the corn, milk, egg yolks, and ¾ tsp salt. Blitz for a few seconds, to form a rough paste, then spoon into a large bowl. Place the egg whites in a separate clean bowl and whisk to form firm peaks. Fold these gently into the runny corn mixture until just combined, then pour the mix evenly over the chicken. Bake for 35 minutes, until the top is golden brown. Keep an eye on it after 25 minutes to make sure the top is not taking on too much color; you might need to cover it with foil for the final 10 minutes. Remove from the oven and set aside for 10 minutes before serving.